This is our most popular program that we provide. 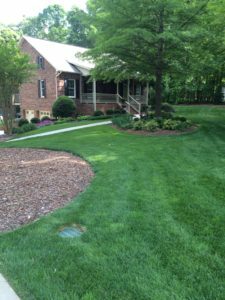 The complete lawn care program is a seven step designed program. This covers weed control and fertilization needed for an entire year. If you would like a more detailed description and what this plan entails please click here. The first round is typically applied in February and the last application is done in December. This ensures our trained technicians are on your lawn throughout the year. We only use top rated products for our applications and to guarantee each round is successful. All of our programs are well- suited to grow and cover every type of turf grown in NC. These turf types include Fescue, Tall Fescue, Zoysia, Bermuda, Bermuda- Hybrid, and Centipede. We will guarantee our programs success. Our combined knowledge and experience in this field is goes over 75 years!